I recently got my collection of Tull albums out of the loft as I'm getting a record player for my 53rd birthday this month. Amongst them I found I had two copies of LITP - the common one on Chrysalis blue label CJT1 and also another with a white label 2CH 1035 (2TS 2106). The label states PROMOTION NOT FOR SALE. the album sleeve is the same as the other album except it's a slightly different colour and is of much thicker card. My question is how common is this album ? I've no idea where I picked it up or how much I paid for it. Welcome to The Jethro Tull Forum snapper63 I'm pleased you finally found us. I'll wait for our Tull Oracle maddogfagin to answer your question, in the meantime I look forward to your future posts. I have every Tull album - started collecting when HH came out. Bought every album as it came out from then onwards, while getting all of the early ones from local record stores. I was lucky enough to be able to purchase TAAB with the full paper and the LITP with the full photo booklet. Also PP with the gatefold sleeve and opera programme. Hi snapper63 and welcome along to the JT Forum. There are so many friendly members here so feel free to join in with discussions etc. I'm certain that the white label LITP x2 CD album is American and if it's on the Chrysalis label then the record number would match. In 1972 Chrysalis took over from Reprise to market the Chrysalis label and a promo would match this date. If the record is on the Reprise label (also confusingly from 1972) then it's an original promo from when the release was first issued. As with many promos, this release is not that common but its condition will effect its value. 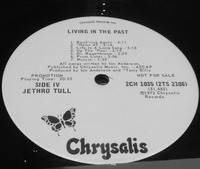 It is indeed on the Chrysalis label and is in excellent condition.